Mural Description From the Lectures of Rabbi Edgar F. Magnin, 1929-1930: Jews are seen engaged in study; however (hovering horizontally) above them is the symbolic sword of Rome. In the center circle is Flavius Josephus, a Jewish general and historian, hiding in a cistern (an underground reservoir) to escape the Roman troops. To the right of the circle is a battering ram, used by the Romans to destroy the walls of Jerusalem and the Temple in 70 CE." Despite continuous instability in Judea and the Near East due to ongoing invasions and changing rulers, the Jewish people endured as best they could, stay true to their faith and ultimately adapted to new political realities. During this tumultuous and violent period, Jews disagreed about who to support and what actions to take to ensure their survival. Through eyewitness accounts such as the writings of Josephus, ancient writers shared powerful historical events enabling us to "stand in their shoes" and experience these events today. What inspires people to stay true to their faith when they are under threat? In times of war, is it ever acceptable to surrender to the enemy like Josephus did? What kind of experiences are worth retelling in an eye-witness account? What experiences have you had which could illuminate this time of history for your grandchildren? Looking closely at this mural section we see the symbolic and threatening sword of Rome hovering over the Jewish scholars, before the destruction of the second Jewish Temple in 70 C.E. What led up to this destruction? In 612 B.C.E the Babylonians overtake the Assyrians, who destroyed the Northern kingdom of Israel. The Babylonians destroy the Assyrian capital city of Ninevah and from this time on the Babylonian Empire rules the region. Their harsh and powerful ruler Nebuchadnezzer begins to conquer all of the smaller states. In 586 B.C.E. after the Jews mount a desperate defense of their city, the Babylonian conquerors destroy Jerusalem and Solomon's Temple and send the Israelites into exile in Babylon. This begins a new way of life for the Jews as they find ways to adapt their religion to a new land without a Temple to make offerings and worship at. In 553 B.C.E. the mighty Babylonian Empire falls to the tolerant King of Persia, Cyrus the Great, who allows the Hebrew exiles to return to their homeland of Judah. The Jews resettle the land and work to rebuild the Temple and return to the laws of the Torah. By 515 B.C.E. the Jews dedicate their new Temple and the era of the Second Temple begins. Two hundred years later in 333 B.C.E. Alexander the Great defeats the Persian Empire and the Hellenistic Greek period begins. By 198 B.C.E. the Greek Seleucid kings of Syria wins control of Judea. Their King Antiochus III adheres to Greek culture but respects Jewish law, unlike his son Antiochus the IV who inherits his rule. Between 175-163 B.C.E. he outlaws Judaism and the study of Torah and forces the Jews to adopt the Greek way of life, language and worship. When his troops defile the Temple and force the Jews to worship the Greek gods, the Jews revolt, led by the Maccabees and ultimately reclaim the Temple as told in the story of Hanukkah. After a short era of peace the Roman Empire comes to power and rules all the lands around the Mediterranean Sea, including Judea. By 37 B.C.E. King Herod is put in control of Judea by the Romans and he begins a monumental building campaign, resulting in the rebuilding of the Temple as well as the new cities of Caesarea and Tiberias and the mountain fortress of Masada. During the Roman rule, Judea was divided between two groups of Jews: the Pharisees who advocated for passive resistance to the Romans and dedication to Jewish law, and those that supported armed resistance and revolt against the Romans. These rebels came to be known as the Zealots. By 67 C.E. the Zealots were rebelling against the Romans with all their might. During this rebellion, a Jewish general known as Josephus hid with his fellow fighters in a cistern where water was collected underground. However, he surrendered to the Romans after the death of his fellow troops who took their own lives to avoid capture. For this allegiance to the Romans, Josephus was considered a traitor by the Jews, but an ally by the Romans who spared his life and sent him to live comfortably in Rome. There he became famous for the important, historical accounts he wrote of Jewish life in his time. His classic books, "Wars of the Jews" and "Antiquities of the Jews," provide readers with one of the few eye-witness accounts of the era in which he lived, including the final destruction of the second Jewish Temple in Jerusalem by the Romans in 70 C.E. The Kotel provides rich archaeological information about the Second Jewish Temple which the Romans destroyed in 70 C.E. The enormous lower stones of the Western Wall were placed by King Herod when he began building up the Temple in 20 C.E. 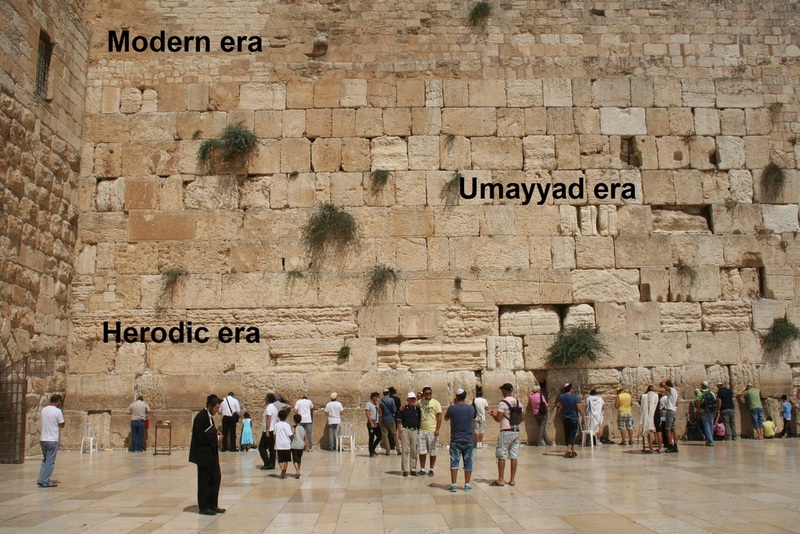 The medium-sized stones in the middle of the Western Wall were laid down later during the Umayyad era (661-750 C.E) by the Muslim rulers, centuries after the Temple's destruction. The smallest ones at the top were built up during the Ottoman and British rule over Israel. Photo by Moshe Gilad, Haaretz. The account by Josephus of the destruction of the Second Temple is powerful piece of writing which is still being read by you, almost 2000 years later! Through eyewitness accounts a writer can share an experience with someone who has never seen the event. A writer’s vivid retelling of an experience can create something like a movie in the reader’s mind, allowing him or her to imagine every detail and action. In this activity, students will put themselves in the shoes of a person living during the Second Temple period. They will write a fictitious “eyewitness account” conveying the drama of the experience. Read together Josephus’ eyewitness account of the destruction of the Temple. Project the text or print out copies for the students. Ask them to underline what Josephus saw, and circle the text of what he heard. Discuss what other sounds might he have heard. What smells were in the air? What would he have felt physically and emotionally? What made this account a powerful piece of writing? The Romans Destroy the Temple at Jerusalem, by Josephus, 70 C.E. References: Josephus' account appears in: Cornfield, Gaalya ed., Josephus, The Jewish War (1982); Duruy, Victor, History of Rome vol. V (1883). "The Romans Destroy the Temple at Jerusalem, 70 AD," EyeWitness to History, www.eyewitnesstohistory.com (2005). Expressive details: use words and images from the worksheet you completed to create a full picture of the event for your reader. Show instead of tell: allow the reader to see through your eyes and hear your voice. An attention-grabbing introduction: pull the reader right into the picture with strong images. Background information: help the reader understand what’s going on. Lots of vivid details: make the experience real for the reader. Descriptive language: help the reader “see” it and “feel” it. Small events and big moments: there is more to an eyewitness account than the big moments; include the small details and events that add up to the big moments. After students complete their final draft of their eyewitness accounts, have all students read their account aloud dramatically to the whole class or in smaller groups. Consider compiling a book of all the students accounts in a Second Temple Diary. Copyright © 2015 Wilshire Boulevard Temple and Creative Ways. All Rights Reserved.